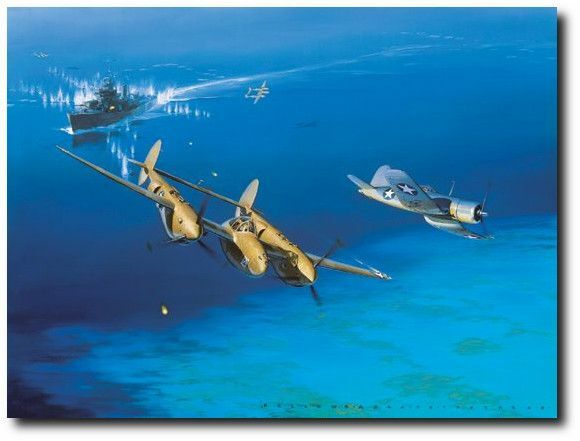 Paper Size: 31.75" x 26.75"
Taking a target of opportunity after a raid on a Japanese floatplane base in the Shortland Islands, five P-38s and a lone F4U attack an enemy vessel. Originally intended to be a combined fighter strike force with eight USAAC P-38s and eight USMC F4Us, the mission was a night takeoff and join-up followed by a low level flight to the target area. A difficult night rendezvous, mechanical problems and enroute weather resulted in only six aircraft reaching the target. After a successful attack on the floatplane base the returning fighters found an unsuspecting Japanese ship. Repeated strafing passes by the fighters left the ship listing and on fire. On his final pass, P-38 pilot Rex Barber focused on the target a fraction too long. When he pulled up the left wind struck the ship's radio mast and sheared almost 4 feet off his wing. With no apparent effects on flying characteristics the pilots returned to their bases. Personally autographed by P-38 pilot Col. Rex Barber and Corsair pilot Capt. Eben Dale.